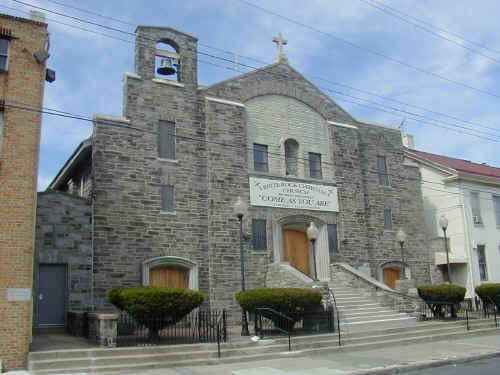 This building formerly housed St. Anthony of Padua Roman Catholic Church. White Rock Christian Church was founded January 9, 1949 as White Rock Baptist Church by James Robert Yarbough. Services were initially held at the home of Pastor Yarbough on Edwards Street. Later, Pastor Yarbough was successful in securing a worship facility located on Second Street. The membership would continue to worship on Second Street for the duration of Pastor Yarbough’s pastorate. During his pastorate membership ranged between 25-30 members. Pastor Yarbough led White Rock for nearly 29 years until his death on November 9, 1977. Robert Leon Clark became the second pastor of White Rock in December 1977. 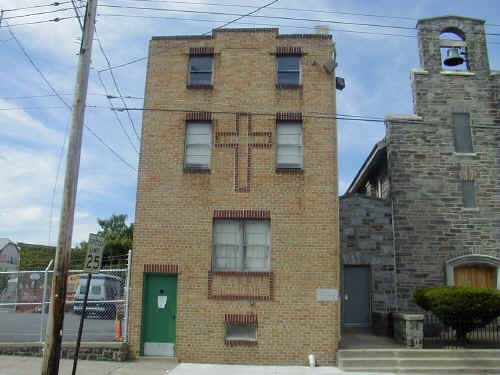 Under his leadership the congregation purchased a facility located at 107 Flower Street. Membership grew to approximately 40 members during Pastor Clark’s tenure. During his pastorate 107 Flower Street was given a facelift making it more conducive for worship. With mixed emotions and prayerful consideration Pastor Clark left White Rock in April 1992. He accepted the pastorate of Unity Baptist Church in the city of Chester. The membership installed its third pastor, Edward C. Lilly on March 7, 1993. At the time of the installation White Rock had an active adult membership of six congregants. The six included Matilda Berry, Rebecca Booker, Edward Holland, Ernestine Hull, Marie Miller, and Margaret Yarbough. Pastor Lilly brought with him his wife Annette, their sons Brandon and Courtney, and their daughter Destiny. Thereby, doubling the size of the congregation immediately. Through God’s grace and mercy White Rock began to spring to life. In August of 1993 the membership began a total renovation of 107 Flower Street. Pastor Lilly insisted that the work of God could be accomplished through the giving of tithes and offerings. Through faith, dedication, hard work, and the help of many volunteers the work was completed without the need to borrow any funds. By the end of 1993 the membership had grown from six to sixty. It was in 1993 that the name of the church was changed to White Rock Christian Church. During 1994 and 1995, the membership continued to grow. It soon became apparent White Rock would be required to go to two services on Sunday or find a larger facility. As God would have it the former St Anthony of Pauda church buildings and grounds located at 308 West Third Street were vacant and for sale. With the assistance of the law firm Morgan, Lewis, and Bockius an agreement of sale was successfully negotiated with the Archdiocese of Philadelphia. On the first Sunday of April 1996 the congregation moved into its new worship facility without fanfare. Similarly, without fanfare, the mortgage was retired six years early. Membership has grown in excess of 700 with weekly attendance often in excess of 400. The deacons of the church are true armor bearers, carrying out the major programs of the church including Buildings and Grounds, Hospitality, JAM , JIF, Membership Development, ROCK, Special Programs, and Transportation. These programs are made successful because of tithes and offerings and the generous donation of time by willing workers. As of this celebration, White Rock is fifty-four years old. Our history is rich and our future is bright. When the day comes that you stand before your maker you should be proud to say, “May the works that I’ve done speak for me”. "White Rock Baptist Church was founded by my late grandfather, Rev. James Robert Yarbough. My grandfather's first church was in his home on Edward Street during 1953. After the death of my grandmother, his wife, Carrie Yarbough, my grand continued to be a pastor of his flock. Later in life my grandfather remarried to a wonderful lady named Margaret, whom I was glad to have as a new grandmother. They moved, and opened a new church on Second Street. My grandfather passed away Nov. 9, 1977. Even though my grandfather is gone, and there is a new pastor, the church still carries the name White Rock Baptist Church on Third Street, Chester, Penna. If you are ever in need to hear a great service, please feel free to go and, if you are ever there, look for my grandfather's picture hanging in the church." © 2001, 2002, 2003 John A. Bullock III.